A masterpiece for the drawing/living rooms, our decorative wooden sofa has elegant design and woodwork. 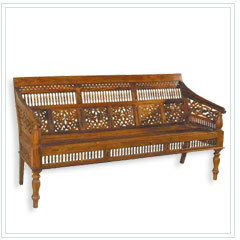 Teamwork Inc. is one of the leading and most trusted buying house and sourcing agent of authentic Indian handicrafts and a variety of premium quality home decor items. We have been in the business for over two and half decades and our core competence is our team of master craftsmen, who belong to different regions of the country. This enables us to successfully meet the demands of our global clients offering them genuine craft works of Indian artisans. Over the years, we have carved a niche for ourselves through product diversity and traditional art. We have a proven record of meaningful bottom-line results. Significantly, Team Work''s team of artisans and designers have also perfected the fusion art and can even custom design products as per the choice of our clients. The sole objective of Team Work is to provide its clients with an experience that is distinct ? both in terms of product offering and the level of customer service. Besides, Team Work also recognizes the fact that its people and in particular its continuing ability to inspire, motivate and reward them, are critical to the achievement of their aim. Today, each and every product, sourced through us, has the Team Work''s signature style ? The guarantee of quality, authenticity and trust.